On April 20th 2012, officials from DDA, along with a huge deployment of policeman, began the process of demolition in Gayatri Colony, near Baljeet Nagar (Anand Parbat industrial area). Earlier last year, portions of this slum cluster were demolished by the DDA. It is to be noted that no prior notification was released by the DDA about this demolition drive. As a result, the residents were taken completely off-guard. When the hapless residents tried to collect their belongings, they were thrashed by the police. More than 1000 families have suffered a huge loss of property, and are now denied basic amenities like shelter, drinking water, sanitary facilities, etc. Even now bulldozers are razing large portions of the slum cluster. 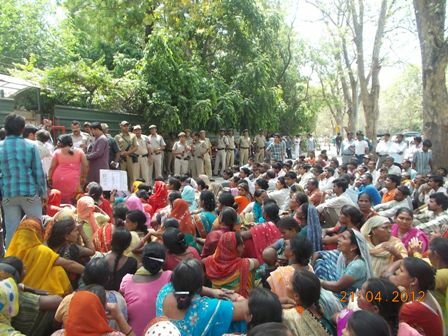 The agitated slum dwellers decided to protest outside the Chief Minister’s Office in Janpath, and bring to her immediate attention the plight of the thousands of impoverished workers and their families residing in the slum. 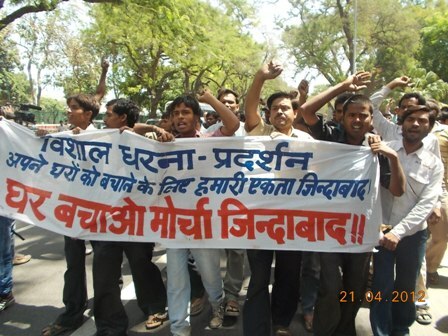 The agitation was carried out under the banner of the Ghar Bachao Morcha, a body formed by the slum dwellers last year itself. The Hon’ble Chief Minister met with a three member delegation which apprised her of the large scale loss faced by the residents. In a powerful memorandum submitted to Shrimati Sheila Dixit, the slum dwellers argued how the DDA was encroaching upon their right to shelter which is enshrined in the fundamental right to life [Article 21, Constitution of India]. 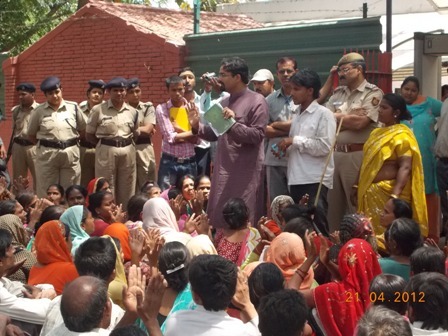 The delegation also apprised her of the police atrocities committed during such demolition drives. The agitating slum dwellers have highlighted how most of them are migrants who have come from villages and tribal belts in search of honest employment. Facing financial ruin due to the precarious agrarian cycle, or because they have been displaced due to industrial/mining projects in tribal belts, many migrants come to cities like Delhi. Most of the male migrants work in factories/sweatshops or as rickshaw-pullers and vendors. Women migrants work as maid-servants in people’s homes or participate in the informal sector of the economy. Despite their important role in the socio-economic fabric of this city they are treated with little respect and made to feel as if our lives have no value. The agitating slum dwellers also highlighted how in a city where the law pertaining to rent regulation and minimum wages are violated continuously, migrant workers have no option but to reside in the cities in the slums. With their meager incomes and faced with the problem of soaring rents in authorized colonies, they are forced to live in slum settlements like Gayatri Colony. 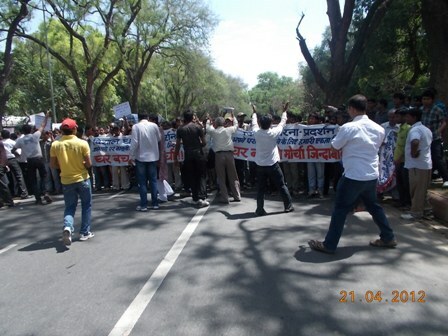 Activists from the Ghar Bachao Morchs also highlighted that the past record of DDA’s slum-clearance clearly shows that lands from which slum dwellers are evicted are mostly used for construction of malls or high-rise residential complexes which only the rich can afford. This, they argued was most unfortunate, considering that the DDA is supposed to cater to the needs of all strata of society. However, in reality very little of DDA’s finances are spent on housing projects for the poor. Hearing their case, the Chief Minister agreed to a second meeting on Monday, 23rd April at her residence. She has assured the Ghar Bachao Morcha members that DDA officials will also be present at the meeting so that some immediate resolutions can be reached. The question of compensation to those who have lost their belongings will be central to the discussion. As of now, the CM has also assured that the demolition drive will be stopped.